Larry is operating a lemonade stand, and he thinks that his lemonade is the most valuable drink available. Because he interprets his lemonade as highly valuable, he decides to charge $85 for a glass of lemonade. Larry wonders why no one buys his lemonade. Although he may seem highly profitable when you work out his unit economics, he has not sold a single glass of lemonade. Like Larry, you may need a new pricing strategy. What is your current pricing strategy? For example, you may be setting the prices on your perceived value of your product/service like Larry. But have you thought about how you could price your products/services better to improve your company’s profitability? What is a Pricing Strategy? To determine if you need a new pricing strategy, you need to identify what pricing strategy you are currently using. Often, pricing is seen as the marketing and sales department’s role. But as the financial leader’s role morphs into a value adding position, you must work with every department (including marketing/sales) to be able to squeeze profits from every corner of the business. When you are looking for a new pricing strategy, you should assess the different types of pricing strategies and the reasons for picking a one over another. Some of the more common pricing strategies include neutral, penetration, forward, skimming, and value-based. Although there are other strategies that we could dig into, these are among the most popular. The first pricing strategy that companies can use is the neutral pricing strategy. As the most common strategy, businesses price their products or services so that their customers are indifferent between a competitor’s product and yours. After taking into account all the features and benefits of the product, the price is set – essentially making you neutral in the pricing game. While this may seem intelligent, it makes it difficult to expand your customer base as they have no real reason to choose your product over another of the same price. There is no value expressed in the neutral pricing strategy – thus, limiting the profit capabilities. If you want to gain more profit margin, neutral pricing strategy is a safe (and ). To price your product or service correctly, download our Pricing for Profit Inspection Guide whitepaper! If you want to be more aggressive than the neutral pricing strategy, you may want to choose the penetration pricing strategy. This strategy is used to gain market share, but it has several drawbacks. For example, price wars can start between competitors. Because you don’t want to lose your market share, you may be tempted to lower your prices. But your competitors will likely lower their prices as well to compete for their customers. If you continue to lower your prices, your margin will be squeezed until you are unprofitable. Grocery stores most commonly use the penetration pricing strategy. Most recently, Amazon acquired Whole Foods (a traditionally expensive grocery store chain) to compete with other grocery stores such as Walmart, Target, Kroger, and other local stores. As Whole Foods slashes their prices, stock prices in major grocery stores have declined in anticipation of them having to reduce their prices to compete. It’s too soon to see the result of implementing a penetration pricing strategy; but unless these stores gain more customers or offer other profitable products, they will become less profitable. Like the penetration pricing strategy, a forward pricing strategy focuses on the future costs associated with that product or service. Companies are willing to price below cost of goods sold at first if they know that in the future, they will have higher margins. If a company cannot predict that if they sell X units by Y date, then having a forward pricing strategy may not be the best strategy for your business. If you need a new pricing strategy, you need to think about pricing for profit. 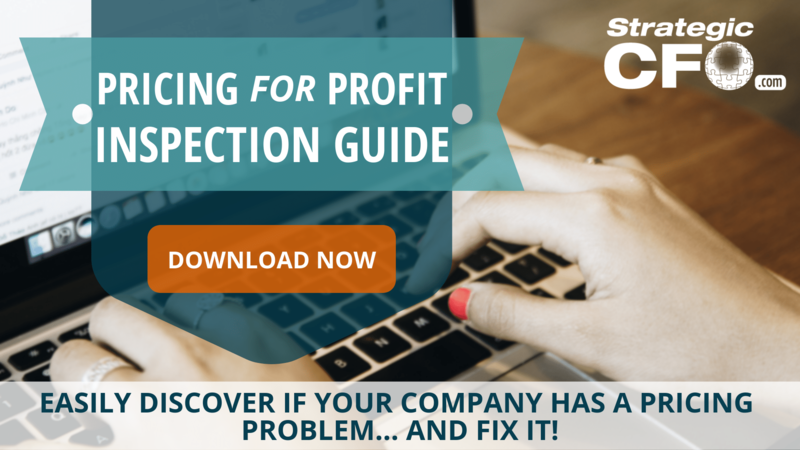 Download our Pricing for Profit Inspection Guide to learn if you have a pricing problem and how to fix it. Converse to the penetration pricing strategy, skimming pricing strategy allows companies to segment the market to gain access to those customers who are willing to spend more per unit. Most commonly, a company utilizes skimming at two different periods in the product life cycle, the beginning and the end of the product’s life. For example, businesses that are in a semi-monopolistic positions use the skimming pricing strategy when launching the product. Think of the iPhone. Apple set their prices for the iPhone high as they were only wanting to sell to those customers with the willingness and ability to pay. As that small market depletes or slows down, Apple reduces their prices to sell to the next tier and then the next. Recently, Apple released the next generation of iPhones – iPhone 8 and iPhone X. If you’re looking to access the iPhone 8 with 256GB, expect to pay $849. You can get the iPhone X for $1,149 with the same storage as the iPhone 8. If you look at the prices of each of their products, expect to pay 2-3 times as much for a similar product compared to other competitors. So how are they so successful? Apple has created a culture in which people are willing to spend a large amount to remain in the Apple community. Unfortunately, not every company will be able to replicate Apple’s pricing strategy. But it’s important for you as a financial leader to study what other brands are doing in regard to pricing. Ask yourself this question: How much is your customer willing to pay for your product or service? There is a price that your customer is willing to pay for something without having any knowledge to how much it costs to produce or anything else. Value-based pricing is the next pricing strategy. While implementing this strategy is not simple, you can potentially gain more profit than using any other pricing strategy available. In business school, students are taught to use the cost-plus method. Instead of adding value with their product, business leaders simple decide on the margin that they would like to have. There’s no real thought process in cost-plus pricing, but it is an easy way to bypass your customer and be in sync with your competitors. For example, Apple has created a value for its products. They didn’t decide on a margin, but instead established such a perceived value that people cannot wait to get their hands on the next product. Some have converted all their technology over to Apple because of that added value. It’s not going to be the cheapest technology on the market and may not even be the best. But the customer is willing to pay for it at the price Apple has set. According to CNN, Apple is worth $750 Billion so they are doing something right! When did you last interview your customers about your pricing? When did you review your pricing strategy last? Have you ever tested your pricing on different groups? Which markets have you not be able to get into yet? Pricing is the basis of your business and is the most important factor in profitability. If your company is solely relying on something other than pricing to improve profitability, you may need to assess why. As you decide if you need a new pricing strategy, assess whether your pricing is a buttress of the business. We can agree on the fact that businesses exist to provide real value. Your business should be structured to support and validate the reason for the price per unit (and the value provided). McKinsey & Company highlights that most businesses do not pay enough attention to their pricing! Most businesses fail to test customer value perceptions and price sensitivity after products launch and have no idea how the critical trade-off between price and volume shifts over time. Second, companies must make pricing decisions in the context of their broader product portfolios because when they have multiple generations of a product in a market, a price move for one can have important implications for others. Price Intelligently references to a “landmark study [that] was published in a 1992 Harvard Business Review by Michael Marn and Robert Rosiello, both senior pricing folks at McKinsey and Company. The dynamic pricing duo studied the unit economics of 2,463 companies and found that a 1% price improvement results in an 11.1% increase in operating profit, which compares to 1% improvements in variable cost, volume, and fixed cost only resulting in profit increases of 7.8%, 3.3%, and 2.3% (respectively)” Having a value-based pricing strategy will improve your profitability. If you are looking to drive more profits this next quarter, you need a new pricing strategy. To learn how to price for profit, download our Pricing for Profit Inspection Guide. Great article that elevates the pricing lever for profit enhancement. While most companies don’t have a strategic pricing department, the CFO often brings a focus to pricing strategies and creates awareness on how pricing can drive profits within the organization. There are many ways to leverage pricing without risk to the business. The key is to get started with the obvious targets and build over time. Some simple scatter plot analyses on price versus customer size is a great starting point that will reveal opportunities.